The opening began with the traditional phrase: "A long time ago in a galaxy far, far away...", followed by a brief prologue. A distant moon came into view in pale gray light. Large bands or rings circled around a gigantic planet named Lah'mu, where a wishbone-shaped Galactic Empire shuttle-craft approached and descended toward a mountain range. A droid with a singular ocular lens watched the craft's fly-by that seemed to threaten a little girl named Jyn (nicknamed Stardust), who ran toward her farm (surrounded by black sands). When she entered, her father Galen Erso (Mads Mikkelsen) and mother Lyra (Valene Kane) were alarmed and anxious. Via video-screen, Lyra contacted Resistance headquarters. After landing, a squad of black-clad stormtroopers approached the domicile, as Lyra and Jyn fled and hid. Jyn was given a necklace (with a crystal) to wear by Lyra and told: "Trust the Force." Galen stoically faced white-capped Imperial Commander/Weapons Director Orson Krennic (Ben Mendelsohn) outside his farm, and deceptively told him Lyra was deceased. As his house was searched by the death troopers, Krennic requested of talented research scientist Galen: "The work has stalled. I need you to come back" - to complete the construction of the Empire's weaponized space station known as Death Star. When Galen refused, Lyra rushed into view with a blaster in her hand, asserting that she would protect her husband: "You're not taking him." She was killed - as she fell, she shot and injured Krennic in the shoulder with a stray shot. Watching from a nearby field, Jyn fled to a dark rocky cave with a secret hatch and climbed down into an attached bunker. Shortly later, Jyn was rescued by Saw Gerrera (Forest Whitaker), the burly, armor-clad leader of the Partisans - a Rebel group. The title screen appeared: "ROGUE ONE." Thirteen years later, grown-up Jyn (Felicity Jones) (with the alias Liana Hallik) awoke in a cell - she was imprisoned by Stormtroopers in a multi-leveled Detention Center on the planet of Wobani, where she shared a cell in the labor camp with a tentacled alien, Oolin Musters. An Imperial pilot [Bodhi Rook], one of the cargo drivers. He defected yesterday. He's telling people they're making a weapon. The kyber crystals, that's what they're for. Tivik called the weapon "a planet killer," and that pilot Rook had been dispatched by Galen Erso (an old friend of Saw Gerrera) . When two Stormtroopers accosted them, Capt. Andor shot both of them, and then killed Tivik to quiet him, before fleeing. On the planetary body of Jedha, an Imperial-Occupied Moon, Empire defector cargo pilot Bodhi Rook (Riz Ahmed) sought to speak with Saw Gerrera, bearing a holographic message recorded by Galen Erso about the planet killer. The distrusted Rook was captured by Gerrera's Partisan soldiers, led by beady-eyed, respirator-wearing militia member Benthic, Gerrera's second-in-command, and taken to their leader in Jedha City. On another planet known as Wobani where an Imperial Labor Camp was situated, a shackled Jyn (now known as Liana Hallik) was being transported in an armored vehicle. Suddenly, the door was blown off and Jyn was rescued by a Rebel Extraction Team, led by Captain Andor. She evaded her captors, but was apprehended by a tall droid and thrown to the ground. She was transported on a spacecraft to a planet's moon known as Yavin 4, the location of the Rebel Alliance Headquarters. The authorities on board, during questioning, revealed that they knew she was the daughter of Galen Erso - "a known Imperial collaborator in weapons development." She was interrogated by Rebel Alliance leaders in the Council, including Mon Mothma (Genevieve O'Reilly), General Davits Draven (Alistair Petrie), Bail Organa (Jimmy Smits) and Captain Andor. The Council claimed that she was being given a "fresh start." Cassian: He's [Rook] claiming the Emperor is creating a weapon with the power to destroy entire planets. The pilot says he was sent by your father. Mon Mothma: We need to stop this weapon before it is finished. Gen. Draven: Captain Andor's mission is to authenticate the pilot's story. And then, if possible, find your father. Mon Mothma: It appears he is critical to the development of this superweapon. Given the gravity of the situation and your history with Saw, we're hoping that he will help us locate your father and return him to the Senate for testimony. Jyn/Liana was convinced to aid the Rebels by meeting with Saw Gerrara and extracting her father (if alive). She boarded a Rebel U-wing craft with Cassian and his reprogrammed Imperial enforcer droid K-2SO (Alan Tudyk) as co-pilot. Before they departed for Jedha, Gen. Draven covertly told Cassian to not extract but kill Galen during their mission ("There will be no extraction. You find him, you kill him. Then and there"). Elsewhere inside one of the monolithic rock formations on Jedha, pilot Bodhi Rook was held captive by Saw Gerrera, and subjected to torture from a slimy cephalopod creature known as Bor Gullet, with six tentacles. During the extreme test of Bodhi's truthfulness, he experienced a temporary loss of sanity. A tie-fighter flew in space toward a gigantic Star Destroyer space-craft - the Executrix - part of an Imperial fleet that was positioned near the moon-sized super-weapon known as the Death Star (with a Superlaser dish installed on its exterior). On the bridge, Commander Krennic met with Governor Tarkin (Guy Henry), who complained about the security breach on Jedha that resulted in the escape of "a rather talkative cargo pilot." Because time was up, Tarkin ordered Krennic to initiate "an immediate test of the weapon." Jyn's Flashback Dream: A brief montage showed young Jyn with her father (wearing an Imperial uniform) and mother in a modern city apartment located in a gleaming megalopolis, where they spoke to Krennic. There were also flash-forwards to Jyn's hiding in the cave, and her rescue by Saw Gerrera. Adult Jyn awoke on board the Rebel craft, clutching her pendant necklace given to her by her mother, as the craft soared over the Imperial-occupied desert moon of Jedha. It landed in view of an enormous rock fortress carved out of a butte, where a huge Star Destroyer hovered above. The Imperial Forces were engaged in a search for terrorist Saw Gerrera, who was attacking cargo shipments of kyber crystals - "the fuel for the weapon" - that were being removed from Jedha. Atop the butte, the holy city of Jedha City thrived with its melting pot of alien species, droids, and others. As Cassian and Jyn (K-2SO remained with the ship) walked through the crowded bazaar and alleyway, a hologram of Bodhi's face appeared, with an Imperial warning to everyone to report any information about the location of the "missing cargo pilot" - offering a reward of 600 credits. To initiate a meeting with Saw, Cassian was looking for the sister of a missing Partisan contact - one of Saw's rebels, who was reportedly at the ruins of the city's destroyed temple. Near the temple, Jyn approached blind warrior-monk Chirrut Imwe (Donnie Yen) who had spoken to her: "May the Force of others be with you. Would you trade that necklace for a glimpse into your future?" Behind Chirrut was long-haired mercenary-assassin and guardian Baze Malbus (Wen Jiang), who was also keeping watch over the temple. As she joined Cassian, Chirrut spoke again to her: "What do you know of kyber crystals?...The strongest stars have hearts of kyber." Cassian rightly identified the individuals as "The Guardians of the Whills. Protectors of the Kyber Temple." Jyn and Cassian were caught up in the middle of an armed uprising between the insurgents and the Imperial Forces in the city, after a grenade was thrown at an Imperial kyber transport vehicle (loaded with kyber crystal canisters) in the street, and Saw Gerrera's Partisan snipers opened fire with blasters. After the first wave of Stormtroopers were killed, a second battalion of reinforcements appeared with a two-legged Imperial walker. Jyn and Cassian were pinned down by more troopers in a passageway, when suddenly K-2SO (who had disobeyed orders and left their craft) arrived to assist. K2-SO impersonated an Imperial droid transporting his two prisoners (Jyn and Cassian), although their disguise quickly failed. However, the two shackled prisoners were rescued by the intervention of blind spiritual warrior Chirrut Imwe, who called upon the mystical Force: "Let them pass in peace. The Force is with me. And I am with the Force. And I fear nothing. For all is as the Force wills it." When the troopers began firing, Chirrut overpowered all of them with his quick senses, offensive martial-arts movements, kicks and his sturdy staff. Another group of Stormtroopers were swiftly blasted by Baze Malbus and his repeater cannon. Suddenly, Partisans (led by Benthic) arrived to take the group of "hostiles" into custody - Cassian, Jyn and the two Guardians, arguing that Cassian had killed one of the Partisans during the uprising although it was in self-defense. Jyn threatened them: "Anyone who kills me or my friends will answer to Saw Gerrera...because I'm the daughter of Galen Erso." The group of captives was marched away for imprisonment and interrogation to the Partisans' headquarters in the Catacombs of Cadera. The Star Destroyer hovering over Jedha City moved away from the butte, while the group of prisoners arrived at Gerrera's headquarters. Cassian and the two Guardians were placed in one cell together, while Jyn was led away by two Resistance fighters to speak to Saw Gerrera. When she confronted Saw (who asked: "Are we not still friends? "), Jyn mentioned that he had left her behind the last time they saw each other, when she was sixteen ("You dumped me! "), although he rationalized that she was abandoned because she was "the daughter of an Imperial science officer!" He softened his wary stance when she explained that she was only searching for her father. She also explained that she wasn't interested in the Rebel cause: "I'm out now. Rest of you can do what you want....All it's ever brought me is pain." In another area of the galaxy, on board the Death Star space-station super-weapon that was orbiting the desert moon of Jedha, Gov. Tarkin and Director Krennic stood before an observation deck window while viewing Jedha's southern pole. Krennic announced: "All Imperial forces have been evacuated and I stand ready to destroy the entire moon." Tarkin over-ruled: "That won't be necessary. We need a statement, not a manifesto. The Holy City will be enough for today." Krennic ordered the firing sequence to commence with a low-powered super-laser test blast: "Target Jedha City. Prepare single reactor ignition." Saw, if you are watching this, then perhaps there is a chance to save the Alliance. Perhaps there's a chance to explain myself and, though I don't dare hope for too much, a chance for Jyn, if she's alive, if you can possibly find her to let her know that my love for her has never faded and how desperately I've missed her. Jyn, my Stardust. I can't imagine what you think of me. When I was taken, I faced some bitter truths. I was told that soon enough Krennic would have you as well. As time went by, I knew that you were either dead or so well hidden that he would never find you. I knew if I had refused to work, if I took my own life, it would only be a matter of time before Krennic realized he no longer needed me to complete the project. So I did the one thing nobody expected: I lied. I learned to lie. I played the part of a beaten man resigned to the sanctuary of his work. I made myself indispensable, and all the while, I laid the groundwork of my revenge. We call it the Death Star. There is no better name. And the day is coming soon when it will be unleashed. I've placed a weakness deep within the system. A flaw so small and powerful, they will never find it. But, Jyn. Jyn, if you're listening, my beloved, so much of my life has been wasted. I try to think of you only in the moments when I'm strong because the pain of not having you with me, your mother, our family, and the pain of that loss is so overwhelming I risk failing even now. It's just so hard not to think of you. The holographic message ended when rumblings were heard and an explosion was seen on the horizon - the total devastation of Jedha City. Dust and debris fell as the insurgents' entire compound shook in reaction to the blast site. Cassian (and the others) escaped from captivity during the chaos. Cassian contacted K-2SO and ordered him to locate their position for a rendezvous with the U-wing ("Bring that ship in here, now! "), while he searched for Jyn in the bunkers of the catacombs. When he found her, he told her: "I know where your father is." Saw was determined to remain behind and die in the rubble ("I will run no longer"), and yelled after them as they fled: "Save the Rebellion. Save the dream!" With Jyn, Chirrut, Baze, and Bodhi on board, K-2SO and Cassian piloted the U-wing through the collapsing rocks and barely escaped, while Saw expired from the blast wave. On the Death Star, Krennic cooly admired the devastation of Jedha City's butte: "Oh, it's beautiful!" by the laser-weapon. Tarkin offered an apology for chastizing him earlier ("Your work exceeds all expectations"), and extolled "the weapon that will bring a swift end to the Rebellion." Tarkin then announced he would take control of the weapon for two reasons: (1) recent security leaks and breaches, and (2) pilot Rook's defection and escape from the Imperial facility on Eadu (Galen Erso's facility), due to help from a Rebel sympathizer. In the Rebel Alliance base at Yavin Four, a message was received by General Draven from Captain Cassian Andor about Jedha's destruction by the Death Star and Galen Erso's location on Eadu. Draven was completely dumbfounded by the news, but kept with his plan: "Tell him my orders still stand. Tell him to proceed with haste and keep to the plan. We have no idea what he is building for the Empire. We have to kill Galen Erso while we have the chance." The U-wing fighter with the Rebels sped through space toward Eadu. When Jyn learned Bodhi had brought the message from her father, she still retained hope: "We can beat the people who did this." She explained how she had listened to the hologram message, including Galen's explanation of a hidden vulnerability in the Death Star that could be used to destroy it. She told Cassian: "He sacrificed himself for the Rebellion. He's rigged a trap inside it." But she could not prove her assertions, because the holographic message no longer existed. She urged informing the Alliance: "They have to know there's a way to destroy this thing" - and suggested going to Scarif to acquire the Death Star's structural plans. When Cassian balked, she suggested rescuing her father on Eadu and having him personally tell Alliance leaders about the weapon's weakness. At the same time, after Tarkin had asserted his dominance over the Death Star project, Krennic departed the Death Star in a shuttle also en route to the planet of Eadu, an Imperial Kyber Refinery. His mission's objective was to expose the Rebel sympathizer in Galen Erso's research facility. Both the Rebel U-wing fighter and Krennic's shuttle were bound for Eadu simultaneously. On their approach to Eadu in stormy and misty conditions, the U-wing craft of the Rebels crashed on the rocky surface while avoiding Imperial detection by flying low. When their craft's signal disappeared, General Draven ordered a squadron of X-Wings to investigate: "Squadron up, target Eadu." Bodhi and Cassian left the damaged spacecraft to trek to the nearby Imperial research facility. When Chirrut mentioned he had sensed a darkness around Captain Andor ("The Force moves darkly near a creature that's about to kill"), Jyn became suspicious of his intentions - to possibly kill her father, and she departed on her own. Chirrut followed close behind her: (noting "Her path is clear") and Baze reluctantly joined him. Far below the jutting landing platform of the facility, Jyn began to climb a maintenance ladder hundreds of feet long up to the cliff top facility. Through electro-binoculars, Bodhi identified Galen within a group of engineers on the platform - distinctively wearing a dark suit. Suddenly, Krennic's shuttle zoomed overhead and landed. Krennic exited his spacecraft, confronted captive scientist Galen, and called for an announcement to Galen's entire group of engineers. He threatened to have Galen's team eliminated for a security leak: "One of you betrayed the Empire. One of you has conspired with a pilot to send messages to the Rebellion. And I urge that traitor, step forward. (pause after no response) Very well, I'll consider it a group effort, then." Meanwhile, Cassian had his blaster rifle's scope and cross-hairs centered on Galen, but declined to shoot. Sacrificing himself, Galen protectively stood in front of his team and confessed that he was responsible for the breach. But it was in vain - Krennic ordered the Stormtroopers to open fire and execute the entire team. Meanwhile, Jyn had made her way onto the platform where she stole a Stormtrooper's weapon. At the same time, K-2SO reported to Cassian by radio that an Alliance X-Wing bombing squadron was fast approaching. As the overhead raid began and strafing of the platform by proton torpedo blasts killed many of the Stormtroopers, Jyn emerged from her hiding place and yelled over to her father, who soon after was lethally-wounded by one of the blasts. Imperial TIE-fighters began to counter-attack with cover fire from cannons on the besieged platform, while a massive dogfight raged in the air. After Krennic had escaped in his shuttle, a dying Galen spoke to Jyn - he learned that she had seen his message and he vowed to her: "It must be destroyed." He died in his daughter's arms, as Cassian arrived to pull her away to join the small group of surviving Rebels, who all escaped in a stolen Imperial cargo shuttle (piloted by Bodhi and K-2SO). During their flight, Jyn confronted Cassian for his duplicity: "You lied about why we came here and you lied about why you went up alone." She also blamed the Alliance bombing raid for killing her father: "Those were Alliance bombs that killed him!" Cassian admitted his guilt: "I had orders! Orders that I disobeyed!" Krennic's Imperial shuttle descended through the clouds over the volcanic landscape of the planet of Mustafar, following a ribbon of lava to its source at the base of a cliff-top castle with dual spires. The shuttle landed on the rear platform of the dark structure. Inside, a black-cloaked figure, Vader's servant Vanee (Martin Gordon) walked along a catwalk through airlocks to a steaming enclosure, flanked by two red-garbed royal guards. The messenger announced that Director Krennic was arriving - he was speaking to Darth Vader (voice James Earl Jones), a dark Lord of the Sith, whose reddish-skinned body was upright in a clouded-over cylindrical tank and hooked up to a respirator. When the cylinder was lowered around Vader, who was meditating in the rejuvenation chamber, his burned cranium was revealed. Soon after, Krennic met with Vader, now wearing a full black cloak, armored body and a dark helmet, and casting a giant shadow. Vader admitted that the Death Star's existence had become very problematic: "Its power to create problems has certainly been confirmed. A city destroyed. An Imperial facility openly attacked." Vader was determined to deflect attention from rumors and keep their weapon a secret: "There is no Death Star. The Senate has been informed that Jedha was destroyed in a mining disaster." After Krennic attempted to blame Tarkin, Vader further instructed: "I expect you not to rest until you can assure the Emperor that Galen Erso has not compromised this weapon in any way." As Vader briskly walked away with his back turned to Krennic, he wouldn't listen to further pleas of Krennic to remain in control and seek approval with an appearance before the Emperor. Vader used the Force to choke Krennic, who reached for his throat and fell to the floor. Vader dismissed him with: "Be careful not to choke on your aspirations, Director." Meanwhile, after returning to the base on Yavin Four, the Rebels participated in an Alliance Council meeting. There were strong differences of opinions expressed about whether to continue the Alliance against the Imperial forces, or to surrender (For example, "It is simple, the Empire has the means of mass destruction. The Rebellion does not"). Some doubted whether there actually was a flaw in the Death Star, and whether it was only a ploy to lure the Resistance into battle - to be destroyed. Jyn counter-argued: "My father gave his life so that we may have a chance to defeat this." She proposed a mission to steal the Death Star schematics from an Imperial installation, in order to properly target the flawed reactor: "Send your best troops to Scarif. Send the rebel fleet if you have to. You need to capture the Death Star plans if there's any hope of destroying it." Although Jyn's pleas for a rebellion were impassioned, there was no consensus reached on committing Rebel forces, and the Alliance officially decided to not directly confront the Empire (Mon Mothma: "The odds are too great"). Frustrated by the lack of support, a rag-tag 'rogue' group of Rebels, including Jyn, Cassian, Bodhi, Baze, Chirrut, K-2SO, and others, decided to act on their own - to take the stolen (and impounded) Imperial cargo shuttle to Scarif without Alliance permission. Jyn greeted her comrades: "May the Force be with us." Pilot Bodhi identified their craft with an appropriate call-sign: "Rogue One" as they departed for Scarif, an Imperial Security Complex. To evade the defensive shield around Scarif, an access clearance code was successfully used to enter a ringed or shielded gateway and acquire landing permission. As they descended, the crew noticed the Citadel Tower - where all the Imperial structural engineering archives were located. Just before landing, Jyn delivered an inspirational speech to the Rebels: ("They have no idea we're coming. They have no reason to expect us. If we can make it to the ground, we'll take the next chance. And the next. On and on until we win... or the chances are spent"). The unsanctioned plan was for Jyn, Cassian, and K-2SO to locate the Death Star plans in the Citadel Tower, while the rest of the squad created a guerrilla-assault diversion on the outskirts of the Citadel area by setting off explosives and attacking the troops. Once they landed, the two uniforms of an Imperial officer's inspection team were stolen - Jyn and Cassian masqueraded as the two officials in order to gain access to the Tower, after taking the tramway to its entrance. Simultaneously, Director Krennic's shuttlecraft landed on the platform at the base of the Citadel Command Center and he exited - ordering an examination of Death Star-related project files. By hacking with a probe into another Imperial security droid, K-2SO learned the exact location of the data vault. Outside, the squad of Rebels began to create the diversion by setting explosives to detonate, alerting Director Krennic to their surreptitious invasion. A garrison of Stormtroopers was ordered to be deployed, although they came under ambush by the Rebels. On the Death Star, Tarkin was notified by an officer on the observation deck of the Rebel incursion and attempt to steal the Death Star plans. He informed Darth Vader of the Rebel access and then ordered the Death Star to jump into hyperspace. Meanwhile, Jyn, Cassian and K-2SO gained entry into a vast computer archives within the Citadel. Unexpected support came from Admiral Raddus (Paul Kasey) on the Rebel's flagship Profundity accompanied by an Alliance Fleet (in three squadrons: Red, Gold and Blue) who amassed above Scarif and battled the Imperial Star Destroyers and TIE-fighters in order to destroy the Shield Gate protecting the planet. A number of Rebel X-Wings and a single U-Wing gunship made it through the shield before it closed. The shield gate needed to be reopened by an explosive blast in order to transmit the Death Star plans (data files) to the Rebel fleet. The Imperial advance was aided by the appearance of 4-legged Imperial Walkers. The Rogue One Rebels were reinforced by an air assault on the Walkers by the U-Wing gunship, and from Rebel troops that emerged from the gunship. Outside the shield, Rebel X-Wings fought off TIE-fighters in vicious air battles as they attempted to blast open the shield gate and penetrate the force shield. After gaining unauthorized access to the Citadel's mainframe vault, K-2SO protected Jyn and Cassian by closing the vault's main entry point to the archives' control room when Stormtroopers arrived. Jyn located a "Structural Engineering" file with project code names. She suddenly realized the one file to be extracted - code-named Stardust (her father's nickname for her) ("I know because it's me"). While helping to defend them in the vault, K-2SO was destroyed by enemy Stormtrooper fire, although he instructed them with his final words: "You can still send the plans to the fleet. If they open the shield gate, you can broadcast from the tower." 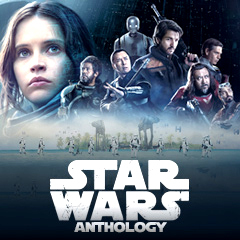 After being notified of unauthorized access at the data vault, Krennic arrived in his shuttle at the Citadel Tower and ambushed Cassian - who fell wounded onto a lower platform, just as he and Jyn were climbing into the tower's vault and physically removing the data tape plans from the data tower. Outside during furious ground fire, Chirrut (while chanting "I'm one with the Force. The Force is with me") activated the Master Switch on a control console to allow communication with the Rebel fleet from Bodhi's shuttle, although he was lethally-wounded by a blast. Blaze ran to his fallen comrade who died in his arms, and then shortly later as he single-handedly battled Stormtroopers, he was hit multiple times before being killed by a grenade. Above the planet, continued Rebel torpedo air-fire pummeled a Star Destroyer and disabled it. The next step was to break open the deflector shield to allow the Death Star plans to be transmitted by Jyn from the Citadel Tower's satellite dish to the Rebel flagship. After delivering his crucial message, Bodhi's shuttle was destroyed by an imploder grenade - killing him and obliterating the shuttle. You know who I am. I'm Jyn Erso. Daughter of Galen and Lyra. You've lost....My father's revenge. He built a flaw in the Death Star. He put a fuse in the middle of your machine and I've just told the entire galaxy how to light it. When Cassian revived, he shot Krennic and severely wounded him. Meanwhile, as the result of a collision of Star Destroyers orbiting Scarif, one of them crashed into the Shield Gate - thereby disabling the protective planetary shield, and opening the communications line. Jyn was able to successfully transmit the data schematics to Admiral Raddus on the Rebel flag ship. Suddenly, Tarkin's massive Death Star emerged from hyperspace. He ordered the firing of a low-powered, single-ignition super-laser beam at the compromised Citadel compound/base on Scarif, mostly missing it but taking off the top of the Tower (and killing Krennic on its upper platform) and part of the surrounding vicinity. Simultaneously, Vader's flagship Star Destroyer arrived, blocking the retreat into hyperspace of some of the Rebel ships (including the destruction of the Rebel's flagship frigate). On the beach near the base, without any way to escape, Cassian and Jyn shared a few last words (Cassian: "Your father would have been proud of you, Jyn"), before a surging blast ring incinerated them during a final hug. Blockade Runner Pilot: Your Highness. The transmission we received. (He handed her the data drive) What is it they've sent us? In terms of the Star Wars chronology, this prequel film's setting and action was set after Star Wars: Episode III - Revenge of the Sith (2005) - and before the events of the first chronologically-released film in the series, Star Wars: Episode IV - A New Hope (1977). It was the first planned film in a new series of films that would be stand-alone spin-offs. This epic adventure-war film was about the efforts of an heroic group of unlikely characters who formed a "rogue" Rebel Alliance (in the Resistance) and attempted to steal the evil Galactic Empire's plans for the destructive Death Star (a deep-space mobile battle station). To be characteristically different from other films in the original two trilogies, the film dispensed with the opening crawl, and familiar side-wipe transitions. Box Office: It was the highest-grossing (domestic) film of its year, at $532.2 million (domestic) and $1.056 billion (worldwide). The science-fi blockbuster beat out Finding Dory (2016) at $486.3 million (domestic) and $1.028 billion (worldwide). The production budget was $200 million. It was also the 2nd highest-grossing (worldwide) film of 2016, falling just short behind Captain America: Civil War (2016) at $1.153 billion (worldwide). At the time of its release, it was the second highest-grossing (domestic) film of the entire Star Wars series (behind Star Wars: The Force Awakens (2015)), but has since also been surpassed by Star Wars: Episode VIII - The Last Jedi (2017). Academy Award Nominations (2): Best Sound Mixing and Best Visual Effects. Set-pieces: the battle between Partisans and Imperial troops in the streets of Jedha, the Test holocaust-like destruction of Jedha City by the Death Star, the Alliance Squadron Attack on the Research Facility Platform on Eadu, and the climactic space and ground Battle at Scarif at the Citadel Tower compound during an attempt to steal the Death Star's original schematic data plans.